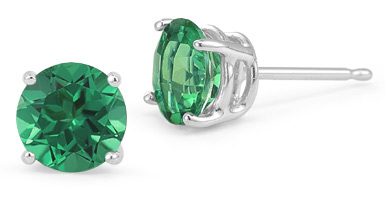 Shopping for emerald studs can be a tricky feat. It is hard to know what quality emerald stud earrings you will be receiving, especially if you are getting a "cheap" emerald for under a $100 or even a few hundred. The reason is that the quality will suffer if you buy too cheap of an emerald. But then you also don't want to overspend. That is why Apples of Gold Jewelry offers quality emerald studs at a moderate price but we use only quality emeralds that please our returning customers. We hand-pick and hand-set our emerald stud earrings to ensure the finest quality available for a mid-range price-point. And here's the good news: we offer a 45-day return policy & free shipping on all of our jewelry, including our gemstone studs, to ensure that you will receive earrings that you love. You can examine the stud earrings and return them if you are not 100% satisfied. It doesn't get any better than that!